Update 25/06/2016: VMware published a KB article covering the issue described in this blog post two days ago (VMware KB 2145895). If you read the KB and the post carefully, you will find some differences. Eg. VMware states in the KB: “No data is lost. Due to this issue, incremental backups are effectively full backups.” As I have seen various affected virtual machines where the backup was not equal to a full backup, I decided not to change the blog post. I still recommend performing a CBT reset to ensure that you can rely on your backup. There is an issue with Change Block Tracking (CBT) in Express Patch 6 for ESXi 6 (Build 3825889) that can affect your backup if your backup software relies on CBT. vmdk : Change tracking is not active for this disk 572. If you already have affected virtual machines, migrate them to a host using an unaffected ESXi version (eg. VMware ESXi 6 Update 2, build 3620759). Hey there…is there an official VMwareKB for this bug yet? Thanks for info! What about replicas? same? Hi, if you have enabled Veeam InGuest processing it will overwrite a set “VMware Tools quiescence” setting in the job configuration. 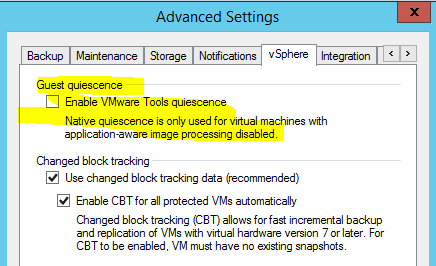 So even if you have enabled quiescence you are maybe not affected because you had enabled Veeam InGuest processing. Hi Andreas. Chris from Rubrik here. Just to confirm, we don’t use the VMware Tools quiescence for application consistent backups and are thus not affected by this issue. Cheers! SNAPSHOT:SnapshotBranchDisk: Failed to acquire current epoch for disk /vmfs/volumes/2f6294e0-bc15bc5d/edeacwdp2vnf01/edeacwdp2vnf01.vmdk : Change tracking is not active for this disk 572. Still investigating if I have more issues. @Luciano: take a look at the amount of data sent to your backup system. There is a good Chance that it is abnormal high compared to incremental backups before applying EP6. @Andreas for now I don’t see to much difference in the backup sizes. But since I had some full backups in some of the jobs, need to double check this in the next incremental backup jobs. Isn’t this fixed in VMWare Tools 10.0.9? VMware top brass are super egomaniac, I really think they have no motivation to make quality software because bugs generate a lot o support revenues for them, and they don’t give a damn about customer complains at all, people should start moving away from VMware products, it’s getting so ridiculously complicated, it will be very buggy and super expensive. Time to plan to migrate to other products in the next 1-4 years.